PRIVY COUNCIL, Flush Twice, Friday (NNN) — Lord Peter Mandelson has become deputy prime minister in the latest cabinet reshuffle, one of the highest positions held by an unelected politician in recent times. Joining him is Sir Alan Sugar, to become Lord Sugar, as enterprise secretary. 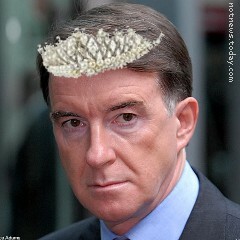 “Elections are so passé,” said Lord Mandelson, “don’t you think? Look at the EU vote. They couldn’t think of any proper parties to vote for, so the few who showed up and could, you know, work a pencil voted in the Nazis and those UKIP idiots. Get daily email alerts of new NewsTechnica! Click here for a random article!